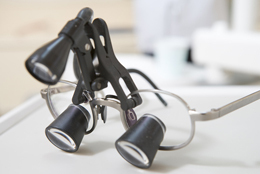 Our practice uses high powered surgical loupes that enables us to create dental restorations with precise fit and finish. The naked eye doesn’t provide the level of care to satisfy our expectations. With magnification the ability to define small details and an increased deep focus range is a must, especially with dentistry. An image that is crystal clear from edge to edge provides superb clarity for procedures that benefit from precise decisions.